A great Sunday to all of you. From my previous post, I mentioned that I have been collecting inspiration for my baby girl’s nursery. Lots of ideas, it’s overwhelming! The last time I felt this was during my wedding preparation, when I was so confused with all the ideas I saw in the internet, as well as friends’ and family’s inputs. Gladly, we got to mix all the great ideas and it turned out to be a beautiful and solemn ceremony for me and hubby, which was enjoyed as well by everyone close to our hearts. Going forward to the present, since I am into the mood for decorating the nursery (at least in my dreams at the moment *wink*), I have also been collecting photos of decors and accents for the baby’s room. They are also found in my Pinterest board, Baby Love. Yes, I’m into pink + gray. Plus, the cutie gray ellie and the message “dream big, little one”, who wouldn’t be in love with this? Words of inspiration not just for kids, but for adults as well. Nobody should stop dreaming and believing in themselves. Green + pink + white also make a good color combination. Love the white owl lamp base! As a way to boost the kids’ learning, my sister K (mom of my 11-month old baby niece, M) shared to me that I should stick alphabets and shapes on the walls. Found some cute frames in Pinterest which I found interesting and easy to do. The above photo has been my inspiration for my first nursery project — the alphabets with the little one’s name highlighted. But instead of repeating the alphabets, I swapped two letters so the letters of her name is in order. For my project, I highlighted M-A-X, Alexa’s nickname. Of course it’s in pink + gray! 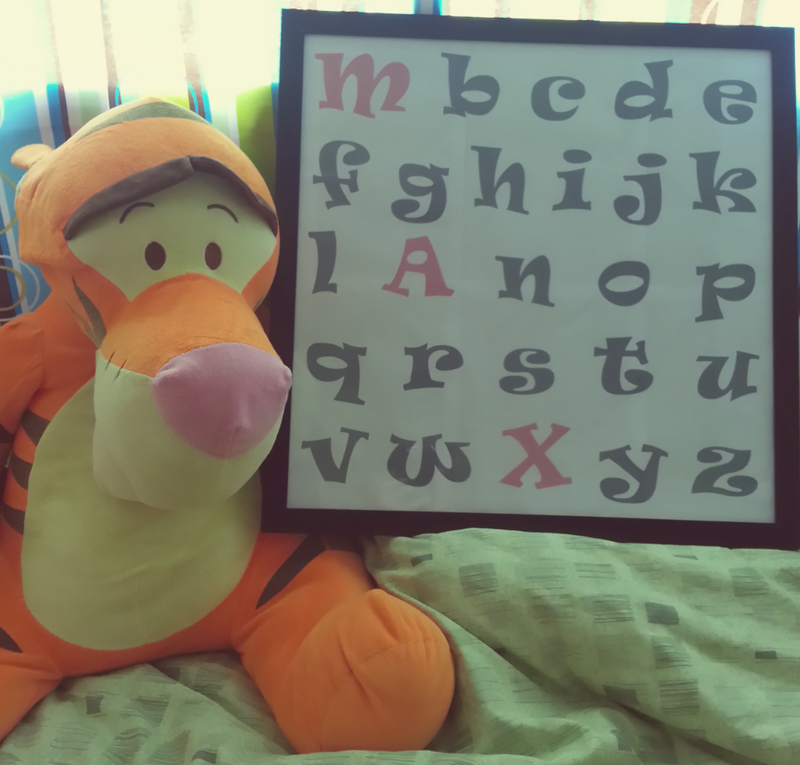 The Tigger stuffed toy was given to me by hubby when we were still dating. And it will be passed on to Alexa. More DIYs (and recipes) are on the line, all reserved to be done after the house move and during my maternity leave. For the meantime, enjoy the rest of your Sunday and wishing you all a great work week ahead! Recently, I have been collecting inspiration for the nursery. I want it simple, soft, and white, with touches of grey and pastels. Love the soft pastel colors! Just replace the blue color with pastel pink, it would be perfect for a baby girl nursery. White + mint is also love! Don’t you love the natural lighting? I am also collecting inspirations for nursery room accents and decorations. I will share it with you in another post. Today, we are starting to pack our things for the house move which will happen in three weeks… excited! Have a great weekend to you all!